Discussion in 'My Favorite Mods, Tips, Tricks (and Blunders!)' started by 94-D2, Apr 21, 2012. I finally completed my galley shelving mod. I needed to change the way the shelve's horizontal support faced so I modified the fitted brackets to accommodate them. Note how the bottom shelf is reversed. DW and I found that when the bottom shelf faces forward as the design intended, it felt crowded and in the way. I considered shortening the lower shelf to 6" from 12, but considered that it was waisting space and increasing the cost since I would be cutting 1/4 of it away. So, reversing the shelf face and modifying the bracket solved the problem. I also added a coffee cup holder to compliment my espresso station. In all there is 176" of shelf space added which effectively triples my countertop storage capability. There is a bunch of items that can be added to these shelves. 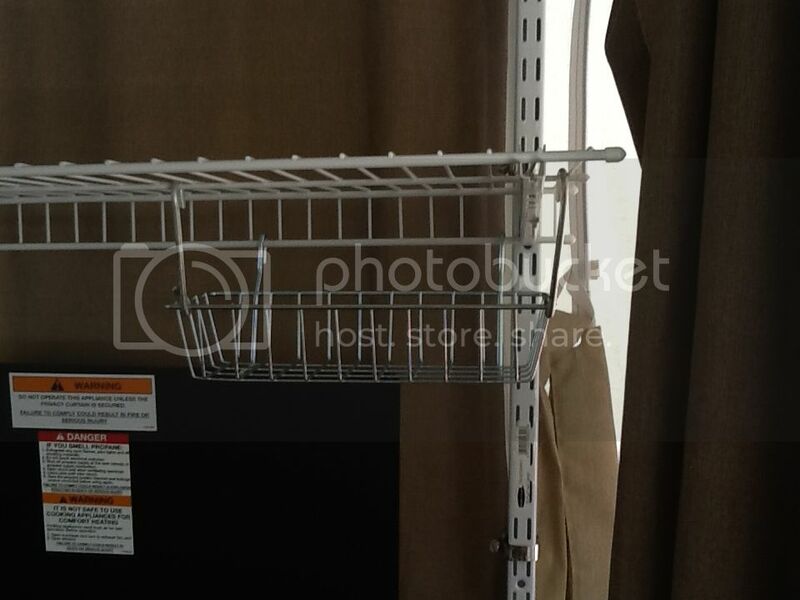 Paper towel holder, dish wash service items, under shelf lighting, just to name a few. Need and convenience will dictate additions. Creative thinking is the key. Many ideas are already available from Ikea, who has a whole line of space saving items. Another area in need was an existing "ledge" located in the entertainment area below the countertop adjacent the couch. This ledge was prone to loosing articles due to the lack of anything to secure it. So, I added a rail which provided a permanent solution and created additional storage during transport. Before, nothing could be stored there. Now, it is a great place to stow many things. It serves well as a DVD/CD case. 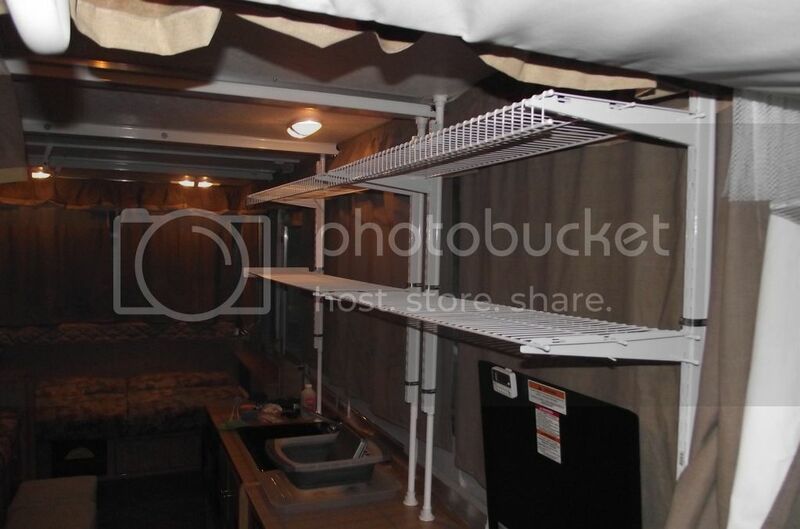 Add a basket, and I have an out f the way place to put a watch, phone, keys and other pocket items upon entering the trailer. Anyway, these are just a few other mods I have done. More to come when my bank account recovers. TerryGoodman, Kiddingaround, BayMom and 1 other person like this. I like what you did in the last photo, looks like it belongs there. are the shower rods just held in place by pressure? Yes they are. These rods twist up and apply pressure. You have to make sure there is support under the cabinet otherwise you will bend your countertop. Then install the clothes bar caps at both ends. That keeps it all in place. I used super strong 3M auto tape for this instead of putting screws in. This stuff is the tape used for trim panels on cars now adays. It is weather resistant and sticks properly. It is also resistant the heat. Other double stick tends to breakdown when it gets to a certain temp. Thanks for looking. Appriciate the positive feedback. I am always interested to see what others are doing. Hopefully someone one else can use ths post as an idea or improve on it. That's obviously what I have hopefully done and benefitted from it. Looks great! Good job J.
I think I'll do this mod to my to-do list. 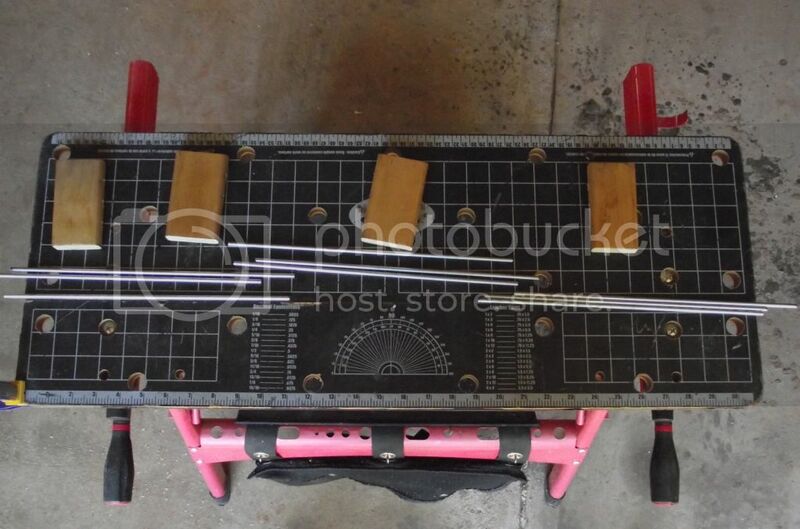 I understand how you mounted the tension rods, but how are the shelf standards attached to the rods? It wasn't cheap but they work really well. Thanks for the fast reply. I have some of these shelf standards (uprights) and brackets laying around from an old construction project that I knew would come in handy some day. All I need are tension rods, end caps and hose clamps. Should come in cheap; I'll try that Habitat and Goodwill stores first. Can't wait to get it done. DW will be pleased. 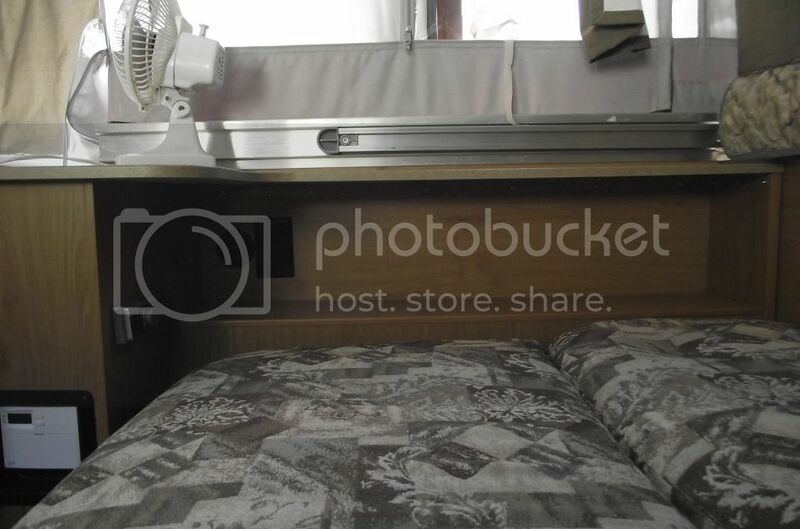 Do you take the vertical uprights(shower rods) and the shelves apart during travel? I would think assembed, yet uninstalled, would still take up plenty of space in the pup. 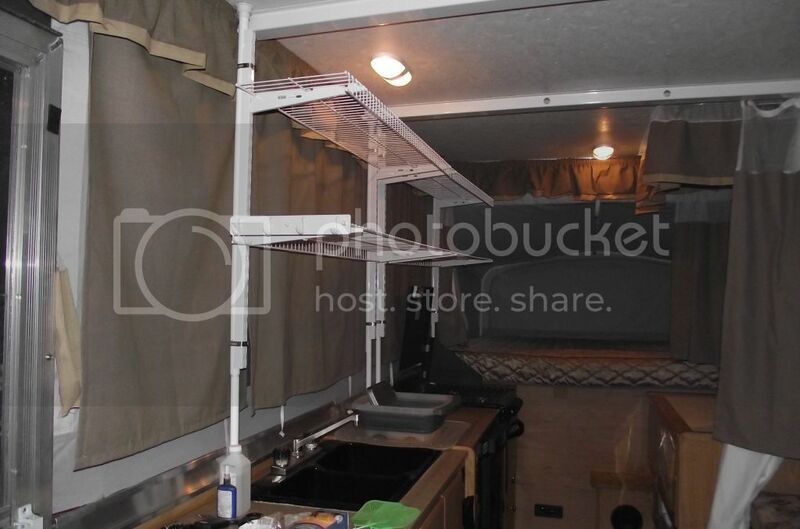 I have a small 8ft camper, and would be worried about where to put the shelves during storage/transit. Very nice styling on the ledge work and good craftsmanship. Looks very nice!! I really like the little shelf you made. I take the whole thing apart. I have the rods numbered for ease of set up. It letterally takes about two minutes to set up. I store these on my dinette slide out in transport. If I did not have the slide, they would fit neatly just on the floor, or front storage trunk if you have one. 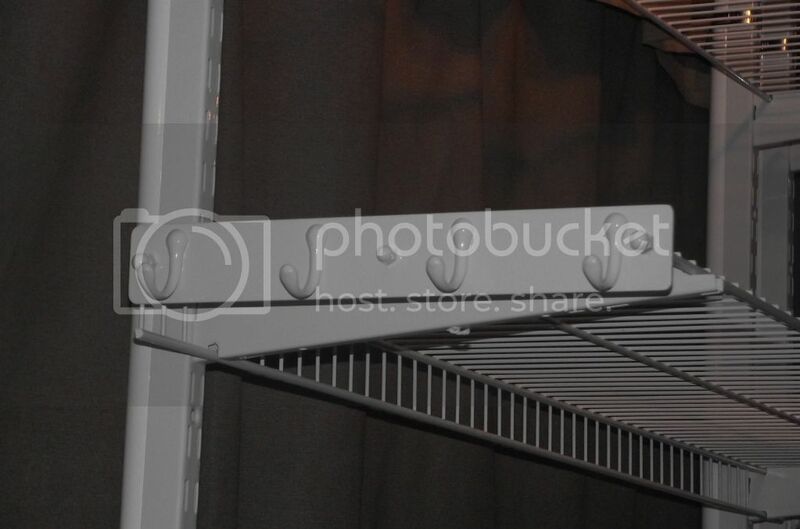 I found that if you bungee the shelves and rods together, they stay put and don't jump around. I wanted some sort of plastic container to put them in but the shelves are 48" long. 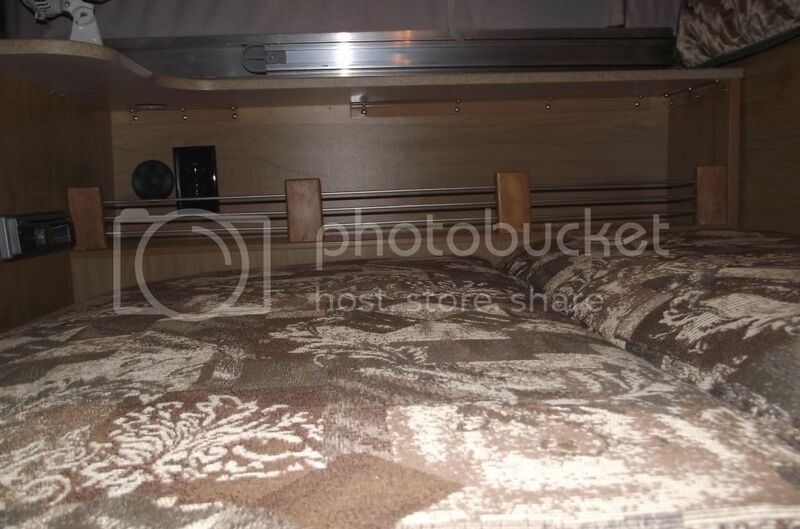 Biggest container I could find for an under-bed type was only 36. So, bungees will have to do. Thanks to all else who comment. Appriciate the kind words. Hope it inspires ideas like it has for me. I find it really part of the fun tinkering as well as the camping and road trip. Way too much fun. Well, I finally found and installed a few additions to the tension rod shelfs. 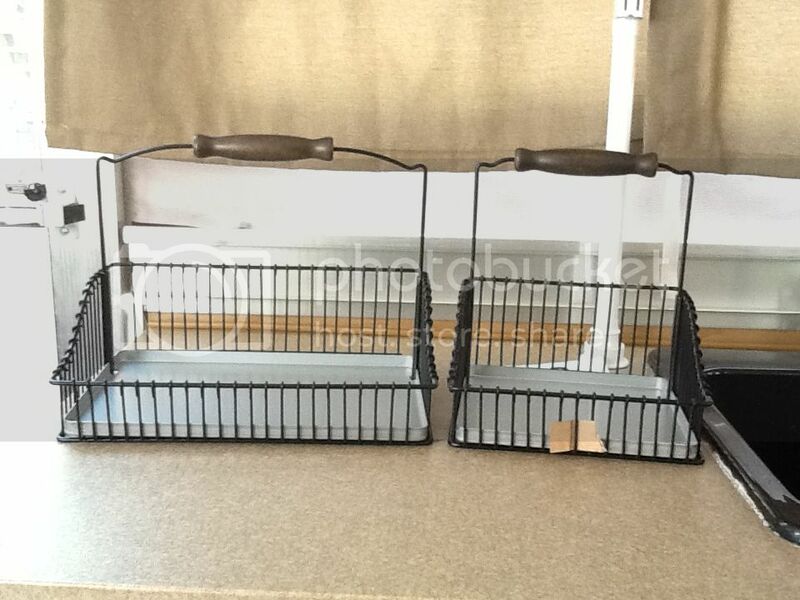 There is always a need for baskets and drawers so I set out to find a few solutions. Only minimal modification was required to customize the items to make them work for my purposes. And these I found at Ikea in the kitchen area. 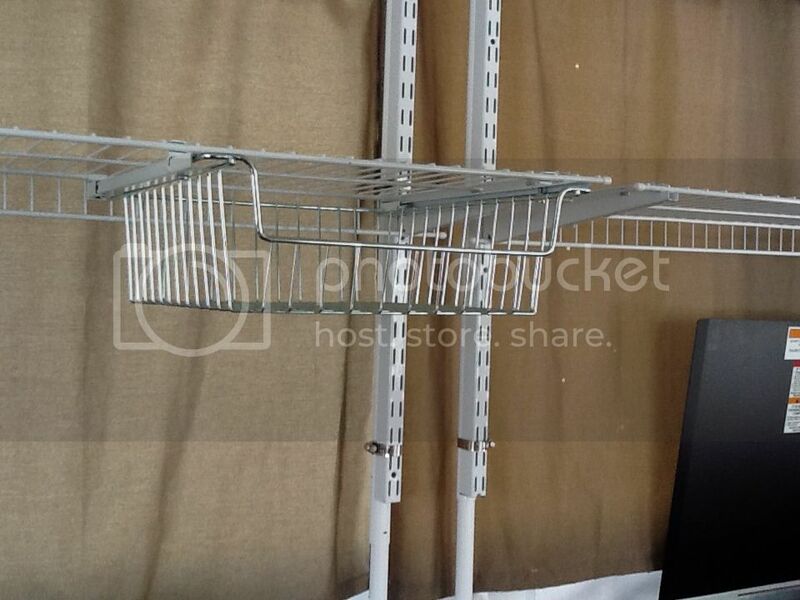 They are extremely universal with its own towel rack style mounting system and hooks. Almost no limit to how you can use these These two were only $15 bucks. Set up and take town take down are simple and inconsequential for time. It is only one more step in removal and can be used or not at will. Cheap, simple and very functional.